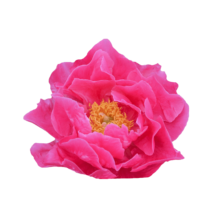 Paula Fay is a real head-turner of a peony with its beautiful bud and alluring, lipstick-pink bloom. Shopkeepers absolutely adore this variety for its impulse-buy-inducing looks. Try as you might, you won’t resist the charms of the lovely Paula Fay! The semi-double flowered Paula Fay has buds that can grow to have a diameter of about 35 mm, which is quite large, and bloom into appealing flowers that are about 15 cm wide. The number of petals in the flowers will keep increasing as Paula Fay grows older. Paula Fay is a voluminous peony, just as voluminous as the better-known Coral varieties. The stems are thick and strong and the flowers odourless, like most hybrid peonies. Paula Fay was registered in 1968 by Orville W. Fay, who named this variety after his sister-in-law. The summery Paula Fay is a gem of a peony, and well-suited for bouquets.